At least 35 military academy students and army members who were earlier dismissed from their jobs and schools over alleged ties to the Gulen movement have been detained. State-run Anadolu news agency said Friday that an Afyon prosecutor issued detention warrants for the 35 suspects. 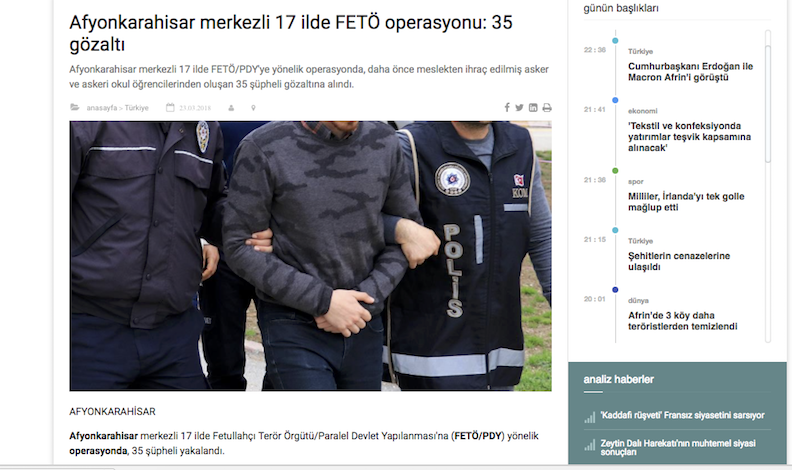 Police carried out operations in 17 provinces and rounded up all wanted over Gulen links. Turkish government blames the Gulen movement for the July 15, 2016 failed coup while the latter denies involvement. More than 150,000 people including thousands of military members have lost their jobs over their affiliations to the group since the summer of 2016.